What is Britain´s favourite snack? A piping hot Cornish pastie, Marmite on toast, jellied eels perhaps? Well no doubt all of the above, but certainly also high up on the list is the humble scotch egg. Consisting of a hard boiled egg encased in sausage meat, breadcrumbed and fried, it was allegedly invented by the Queen´s providore, Fortnum & Mason in Piccadilly London, as a convenience food. The idea was that a scotch egg or two could fit nicely into a gentleman´s pocket or hankerchief to provide sustenance on the long carriage ride back to the manor. Well it was 1738. 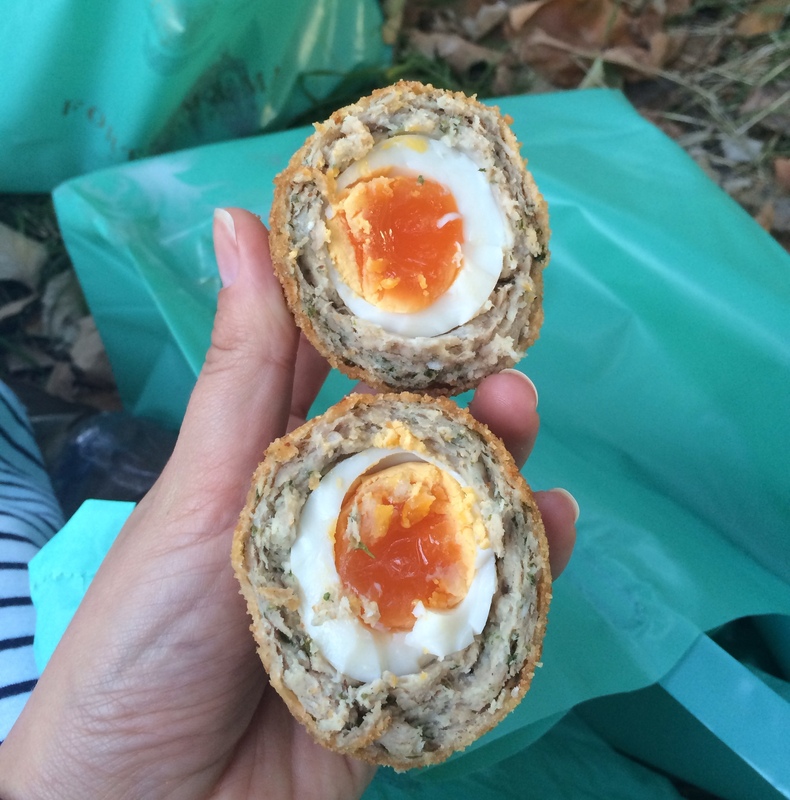 Fortnum & Mason scotch egg: Whether or not you believe their ´traveller´s snack´ tale matters not a jot. Bite into one of these beauties to reveal succulent organic mince and a perfectly cooked soft yolk egg. ´´This is why you must always eat your scotch egg at room temperature´´, I am warned by an over-zealous deli attendent. To heat it would be to cook the egg through and ruin the delicate balance of textures. I challenge anyone to get one home untouched to even attempt warming it up. Scotch egg in the Scilly Islands: The Scilly Islands are somewhat of an enigma to most Brits. Many are not aware of this mini achipelago just beyond the coast of Cornwall. That means all the more scotch eggs for you and I. Pop into Tresco Stores & Deli, make your selection and enjoy with Cornish cyder while perched by the beautiful rugged sea. 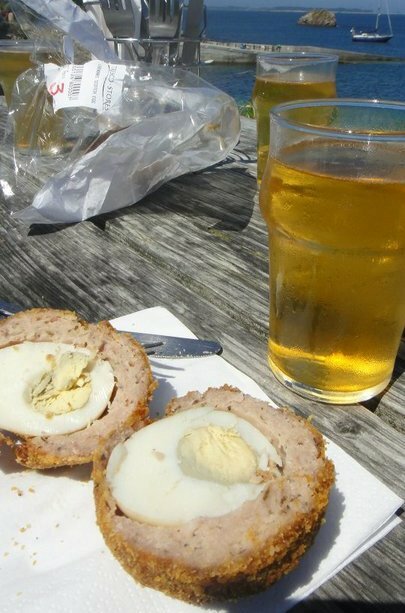 Verdict: Maybe it was the fresh sea breeze or the call of the overhead kittywakes but these scotch eggs were incredible when matched with the local Rattler pear cyder. 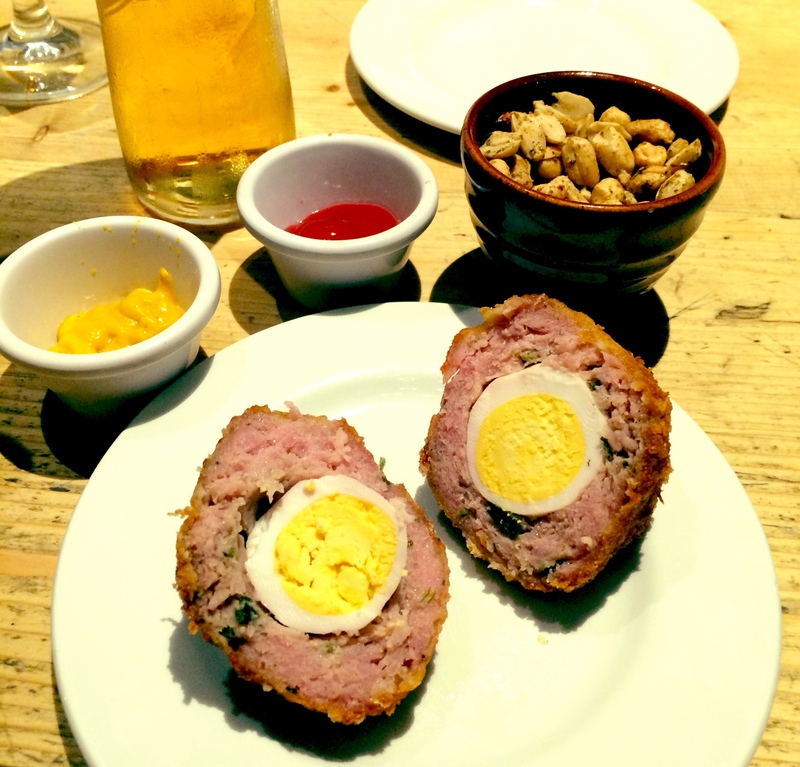 Scotch egg in a pub: British pubs have upped their game on the food front and now you´re less likely to find a tired egg ringed in black and more likely to find an free range specimen blanketed in organic sausage mince. At least I did. And you get the trimmings to boot. Verdict: a little mustard is a good thing but steer clear of the ketchup. 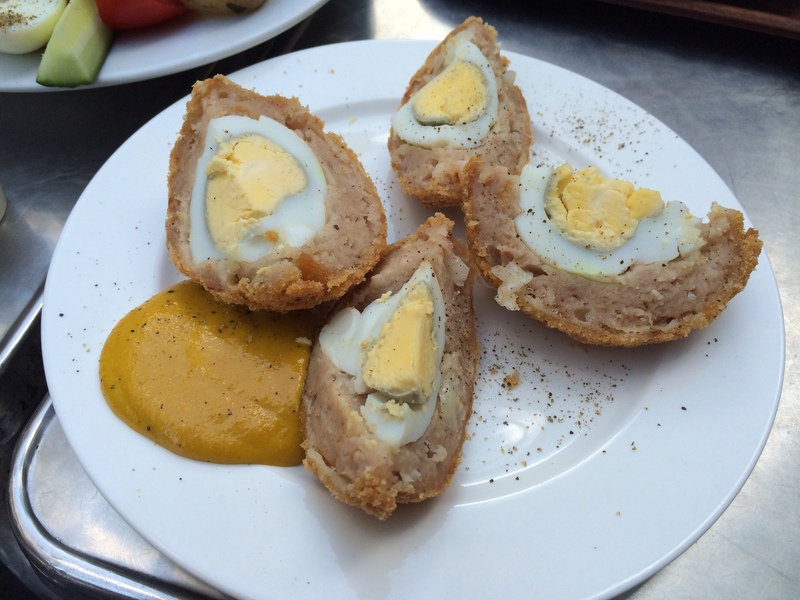 Scotch egg at Borough Market: Expectations were high when I dropped into one of London´s oldest markets. 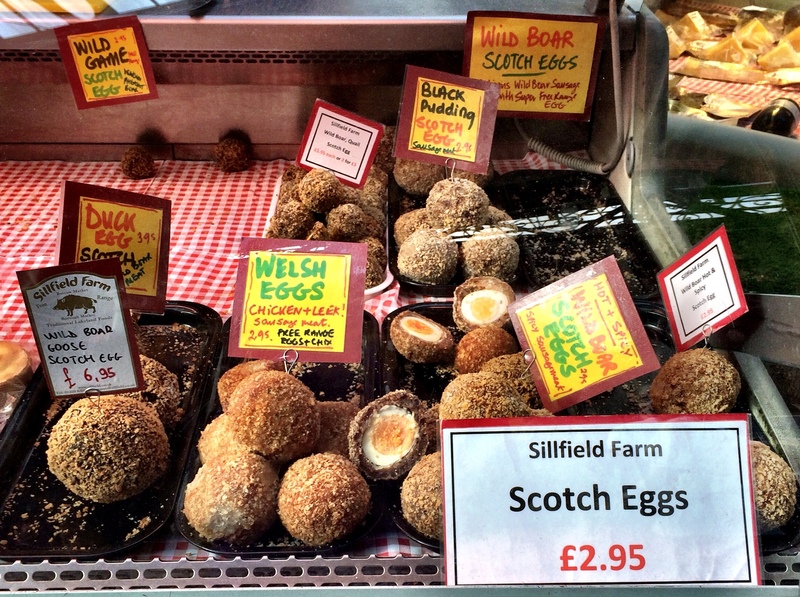 Starting at £2.95 a pop you can select from a range of scotch eggs, all made with free-range pork and wild boar from Sillfield Farm in the Lake District. Oh yes. Verdict: have a play with a black pudding scotch egg or wild boar & quail egg number. You can´t go wrong. If anyone has tried a scotch egg that deserves attention then do let me know!